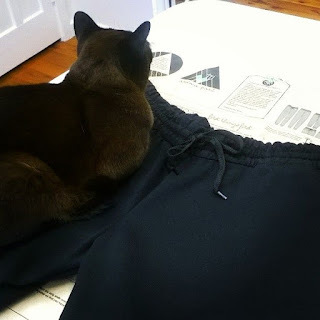 I have made the Papercut Anima pants before at shorts length to trial the pattern and found that I liked the pattern but couldn't see the point of the faux fly. Having the faux fly also made the front crotch impossible to adjust. 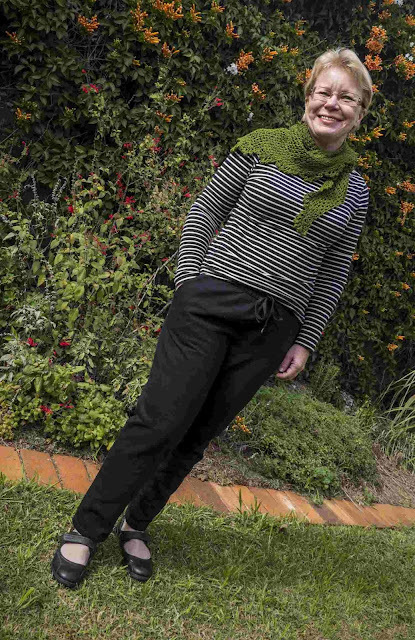 So I have used the pattern now without the faux fly and made myself some warm pants... tracky daks if you live in Aus! The only other change I made to the pattern was to lengthen the leg length slightly (maybe not enough!) as I didn't add the cuff. The pants are made in a gorgeous sweatshirt (listed as sweaty knit in the store) fabric bought from Crafty Mamas. So warm and soft...mmmm! As the fabric is so thick and luxe I made the waistband and pocket bag lining from some black cotton lycra blend. It seems to be working out fine. For the tie I used a long black shoelace - I really like how that works too. As you can see they got cat approval even before I was wearing them! The top I am wearing in the photos is a RTW one and the scarf is the Dory Scarf I made previously. Very happy with my new trackies... Ciao for now kittens! These look great and oh so comfy! The shoe lace is a good idea. Smart looking tracky daks and the shoe lace is a great idea. Oh, what's not to love about a good pair of tracky daks (that's new for me, cute!). I'm wearing a pair of V8909 pants right now, just about the same pattern. Comfy. These worked out perfectly, they look great, warm and comfortable, win! Oh those tracky daks would have been handy in the cold last week! Looking very stylish for tracky daks I have to say. This is a great outfit on you Sue. Nothing ordinary about this at all. Oh boy. These look super comfy!